We develop the EyeSaaS service platform to enable service providers to go beyond basic device management. Whether you’re an ISP customer support representative doing troubleshooting, an engineer preparing to deploy a firmware upgrade, or a product manager or CTO looking for trends, pain points, and potential in your install base–we shape our services to present insight that is actionable to you as a user. Have you ever been involved in configuring an off-the-shelf device management system to your organization’s needs? Or maybe even helped plan and create an entirely new system? Then you know what a long, complex, and resource-intensive process this can be. And that once you have deployed the new system, you need trained staff to maintain and update it and keep it evolving with your install base and needs. EyeSaaS is a service platform that we develop and maintain for you, in a private enterprise cloud. Ease of use and ease of learning are at the forefront, and we keep user documentation open and available. We want your organization to get up and running fast. Therefore, the platform consists of standard modules and flexible workflows that we have adapted to the needs of service providers. Once presented with the your use case as a customer, we take care of the specifications and deliver the service. EyeSaas uses well-known, open industry standards that empower our customers and prevent vendor lock-in. TR-069, the Broadband Forum CPE WAN Management Protocol (CWMP). TR-069 has become the device provisioning standard for the telecom industry worldwide. TR-098, TR-104, TR-106, TR-135, TR-140, TR-157, and TR-181. HTTPS for device communication (when supported by the device). EyeSaaS collaborates closely with our partners to ensure the best possible internet experience for users. We also recommend some infrastructure solutions over others. Our services and platform remain standards-compliant and vendor and device agnostic at their core. The EyeSaaS platform is based on software components from leading Auto Configuration Server (ACS) vendor Axiros. All EyeSaaS services comply with EU privacy regulations out of the box. The platform design ensures that services do not collect end-user identifying data, and each service provider owns and controls the customer identification for their own user base. 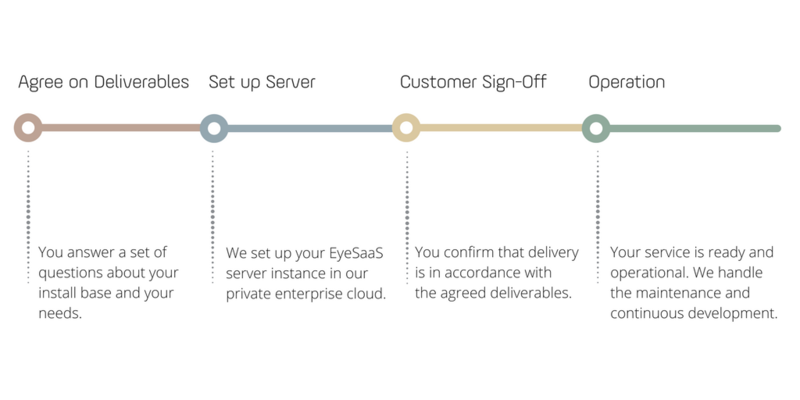 As an EyeSaaS customer, you get your own platform instance in our private enterprise cloud. The Zemware data center setup is secure and fully redundant.